Keep your voice down. This one is a secret. Right now is arguably the best time of the year to be a Hearthstone fan. New cards are being released daily and it can be difficult for fans to contain their excitement. 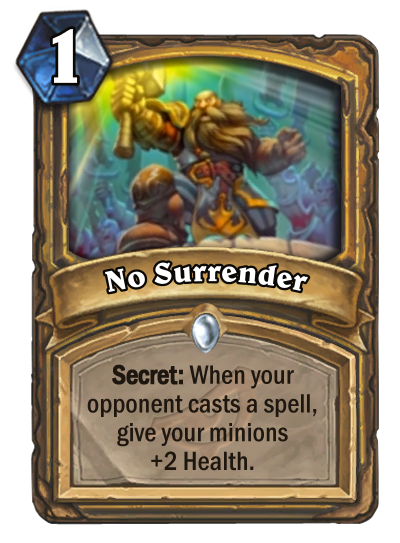 The latest card to join the Rise of Shadows expansion is the Paladin spell, No Surrender. The card is a one-mana Secret that gives +2 Health to all of your minions when your opponent casts a spell. Fans of the Secret deck archetype will be happy to see more of the spell type joining the game. During the lifespan of Rastakhan’s Rumble, the best Secret deck option was probably Hunter. The addition of the new Hunter Hero card Zul’jin really beefed up Secret Hunter, but it looks like Rise of Shadows might make the archetype viable for other classes as well. Secret Paladin is a deck that’s dominated the competitive ladder in various iterations over the game’s lifespan. Since Odd and Even Paladin will be leaving standard rotation on April 9 when Rise of Shadows is released, the class will need new decks to step up and carry the weight—and it looks like Secret Paladin might just be the deck to fill those shoes.